Back in 1924 silent films were all the rage. 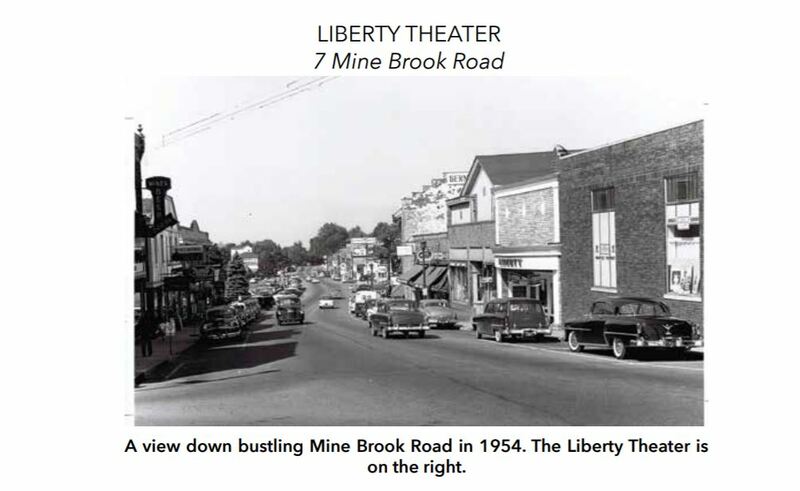 Bernardsville was just becoming a boro and separating from Bernards Township but there was still only one movie theater, The Liberty . 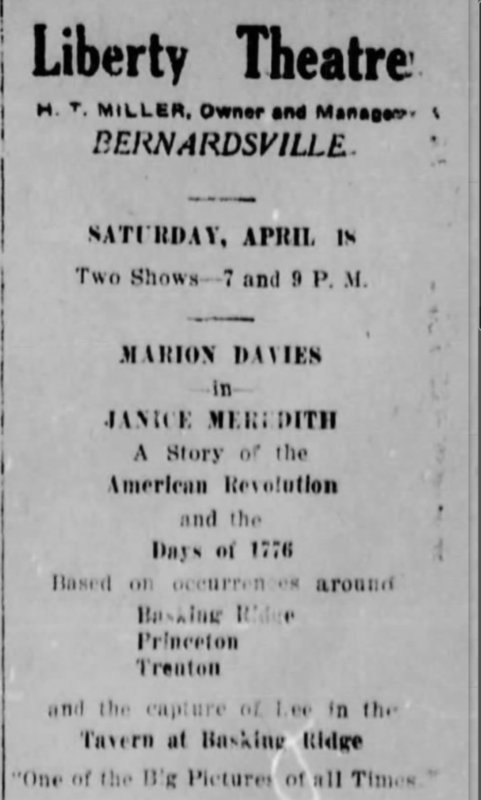 How fortunate was the theater to feature the film “Janice Meredith”, a film about the American Revolution featuring the infamous General Charles Lee. The question is? 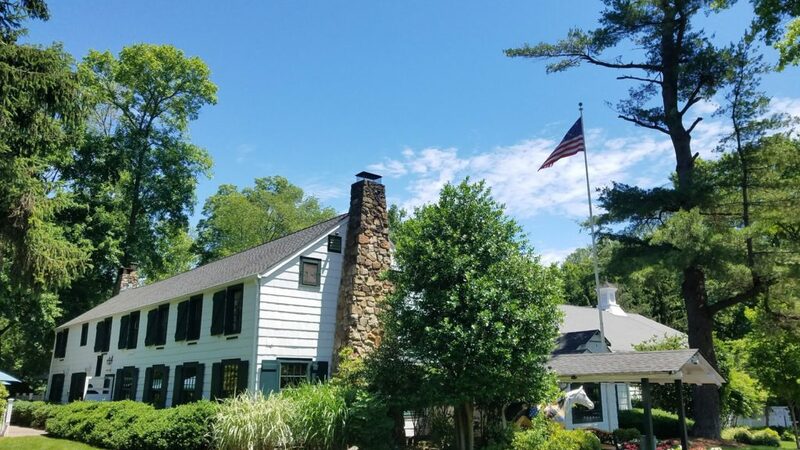 Will they show the infamous Lee capture at Widow White’s in Basking Ridge? We have the complete film at the end of the story. It is 1774, the eve of the American War of Independence. Janice comes from a Tory household. She cavorts with American and British alike, is pursued by Charles Fownes, patriot and friend of General Washington. Fields is a comic, drunken British sergeant. The film is based on the novel Janice Meredith, a Story of the American Revolution by Paul Leicester Ford (New York, 1899). The film took up 11 reels, runs 118 minutes, and was released December 8, 1924. 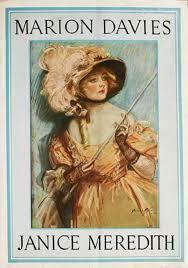 The actors include Marion Davies, who played Janice Meredith. Harrison Ford (not the one from Raiders of the Lost Arc) played Charles Fownes. The famous actorW.C. Fields portrayed a British Sergeant. 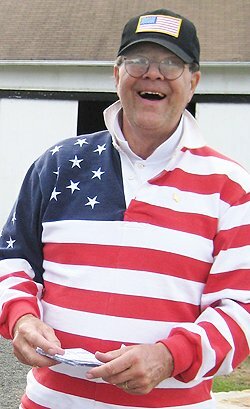 And for those who know the part about Basking Ridge will want to know that Gen. Charles Lee was played by Walter Law. 1924: American actress Marion Davies (1897 – 1961) raises her glass in a toast in a scene from ‘Janice Meredith’, adapted from the novel by Paul Leicester Ford and directed by E Mason Hopper for Cosmopolitan/MGM. “Following a disappointment in love, Lord Brereton assumes the name of Charles Fownes, arranges passage to the American Colonies as a bondservant, and finds a place with Squire Meredith, a wealthy New Jersey landowner. 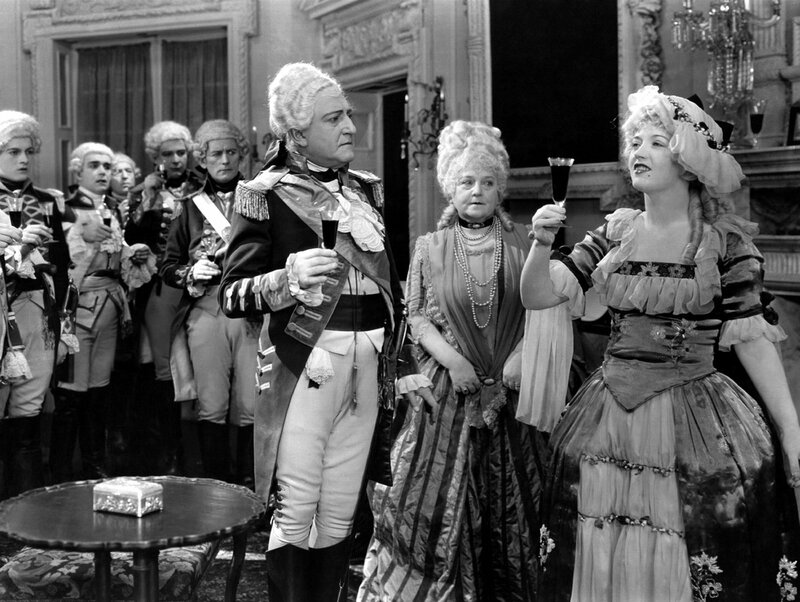 When Charles falls in love with the squire’s daughter, Janice, she is sent to live with an aunt in Boston. Janice learns of the planned British troop movement to the Lexington arsenal and gives the warning that results in Paul Revere’s ride. Charles reveals his true station and becomes an aide to Washington. 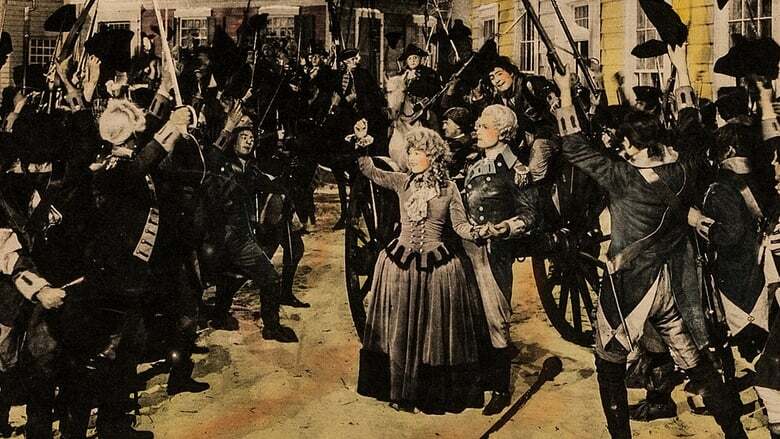 When he is captured by the British, Janice arranges his escape and later helps him learn the disposition of the British troops at Trenton. 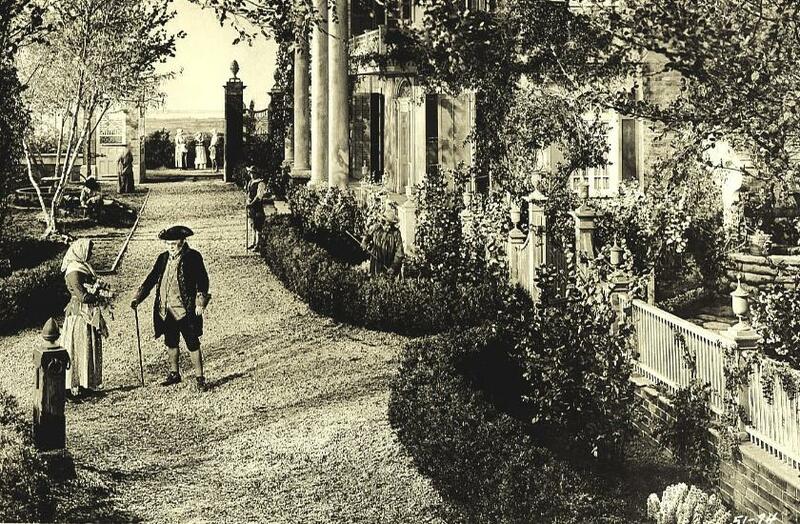 Janice returns to her home and agrees to marry Philemon Hennion, an aristocrat of her father’s choosing. Vernon, where they are to be married in the presence of President Washington. The Liberty Theater was the premiere movie house in the area. While another existed in Peapack, The Liberty Theater was the premiere venue for silent movies in the 1920’s. 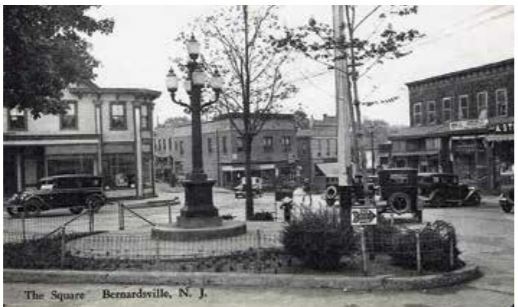 Downtown Bernardsville circle back in the mid 1920s. Source: Bernardsville Library. Built in 1910 by Frank Allen, Bernardsville’s only cinema was renamed the Columbus Theater in 1913 by Joseph DeBelloni. Silent films were shown with dramatic piano accompaniment to enhance the experience. The venue was sold in 1918 to Harry Miller and was patriotically renamed the Liberty Theater. Talkies came in 1929. In 1933, the theater was given permission to show motion pictures on Sundays. It has continued to operate as a cinema since its opening and has changed little on the exterior. The grand, 400 seat theater with a balcony was converted to a triplex theater in the late 1980s. At about noon time on December 13,1776, General Charles Lee (1731-1782), was alarmed by Major Wilkinson while he was writing a letter to General Gates about George Washington in an upstairs bedroom of the Widow White’s Tavern. 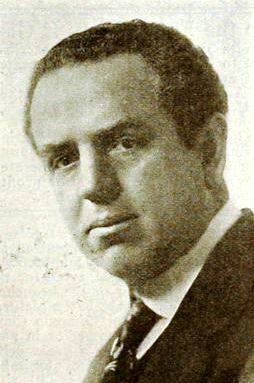 General Charles Lee was played by Walter Law, an American actor who appeared in 47 films between 1915 and 1936. Janice Meredith was his 26th movie. The question is, will the film showcase General Lee’s capture? Let us know what you find. 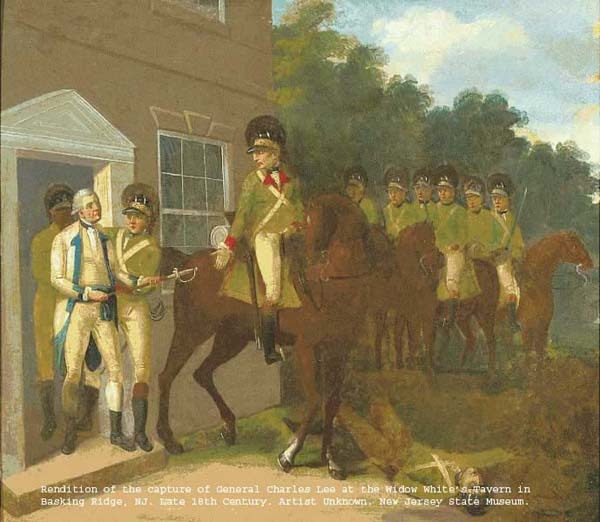 A recreation of the capture of General Charles Lee in Basking Ridge, New Jersey. Widow White’s Tavern, named after Ebenezer White’s wife Mary Brown White, became the centerpiece of Revolutionary War history on that day, because It was on this most unfortunate day for General Lee that General Lee became a prisoner of the British Army, leaving General Washington in a precarious position. Who would have guessed that the Widow White’s Tavern capture might have turned into a blessing in disguise for the young Continental Army.